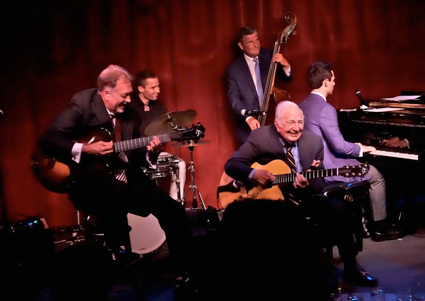 At 91 years old, legendary Guitar Master, Bucky Pizzarelli continues to make great music. His protégé, Ed Laub (guitar and vocals) will once again join him to celebrate Bucky’s Birthday Bash 2017. These two guitar virtuosos will not be alone in this year’s celebration. Bucky’s son, Martin Pizzarelli will return on bass. Konrad Paskudzki (piano) will take the seat behind our concert grand. Born in Western Australia, Konrad spent years playing piano with the likes of the Clayton/Hamilton Jazz Orchestra and the Jeff Hamilton Trio. In 2013, he joined the Johnny Pizzarelli Quartet. Also on the stage will be Dag Markus (drums) and one of New York City’s most sought-after clarinetists and saxophonists, Linus Wyrsch. This birthday party promises to be one of the best! TICKETS: Special pricing: $20 in advance, $25 at the door.